We presented them with copies of two Vision Zero Network reports: Vision, Strategies, Action: Guidelines for an Effective Vision Zero Action Plan and Centering Safety at Metropolitan Planning Organizations. We also prepared for them a short list of Six Examples of Policies a Texas City Could Pursue as Part of a Vision Zero Action Plan, and a list of helpful contacts across Texas to learn more about Vision Zero and implementation in Texas. The Laredo MPO voted to establish a committee to explore potential safety measures appropriate for the regional collaborative approach. 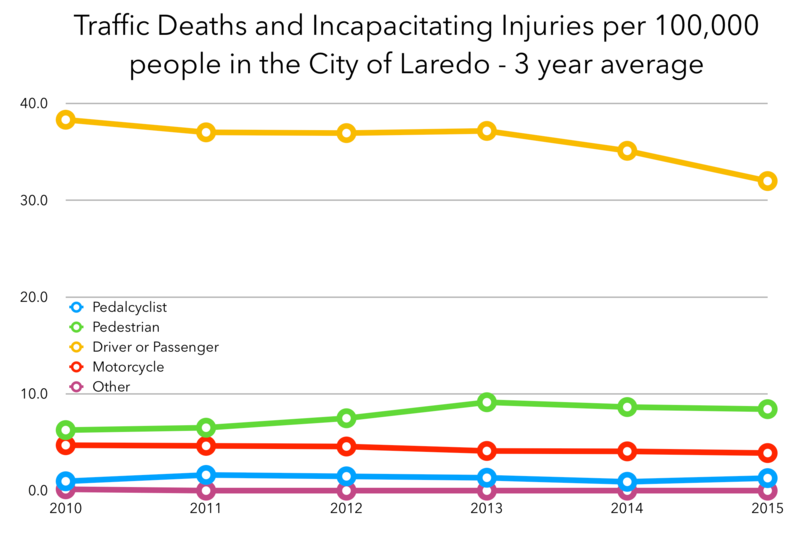 The Laredo City Council asked the City Manager to work with appropriate staff to develop a proposal for the city to pursue Vision Zero. We look forward to supporting the work of the City and MPO of Laredo to end the epidemic of traffic deaths and incapacitating injuries. We had a lovely time visiting the City. The downtown of Laredo is a classic example of traditional North American urbanism, with a terrific, compact street grid, narrow streets with safe design speed and bulbouts at intersections, wide sidewalks, ample shade from awnings and first floor retail. While plans to revitalize will require a suite of appropriate policies, such as you mind find in an equitable, transit oriented development policy, but Laredo still has the bones to build up that many Texas cities are so sorely lacking. We were especially impressed with the strong showing of citizens of diverse ages at the City Council meeting and the general environment the council seems to have cultivated to allow robust discussion with the public to be integrated into their decision making. Below are videos of our presentations and Mr. Ratke’s.